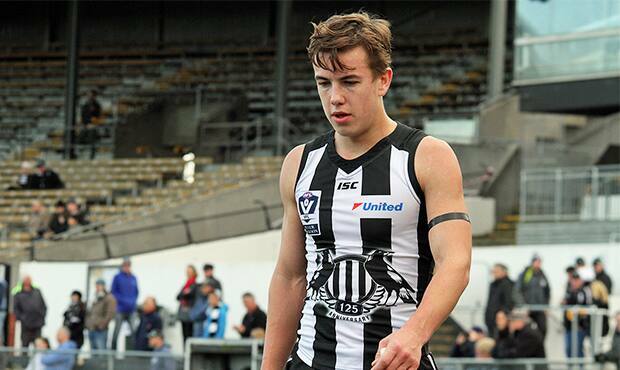 Callum Brown was a solid contributor in the VFL Magpies' heavy defeat to Williamstown. The VFL Magpies’ three-game win streak has come to an end after falling to Williamstown by 60 points at Victoria Park on Saturday afternoon. Two costly fade-outs from the Magpies in the second and third quarters resulted in the Seagulls claiming a strong lead – and one that they wouldn’t surrender for the rest of the game. In each of the quarters that followed the opening 30 minutes, the away side piled on six goals. Collingwood struggled to contain Williamstown’s small forward Michael Gibbons, who did as he pleased in the third quarter, kicking three of four goals for the game. It was a scrappy affair from both teams, but the Seagulls’ class in the moments that mattered proved too much for the Pies to handle. It was a disappointing day for the Magpies after a strong month of form. Collingwood defenders Jackson Ramsay and Marty Hore were impressive from the back six, while captain Jack Hellier (two goals), Rupert Wills, Lachlan Tardrew and Campbell Lane made solid contributions in the middle. The day ended prematurely for midfielder James Aish, who took no further part in the game half way through the third term after suffering a head knock. Utility Tom Phillips played three out of the four quarters for the VFL squad, after missing Collingwood’s AFL clash against the Bombers last week with sickness. The VFL Magpies will look to bounce back against Richmond at Punt Road Oval from 10:20am next Sunday.